Millions of people worldwide suffer from hunger and undernutrition . A major factor contributing to this international problem is food insecurity. This condition exists when people lack sustainable physical or economic access to enough safe, nutritious, and socially acceptable food for a healthy and productive life. Food insecurity may be chronic , seasonal, or temporary, and it may occur at the household, regional, or national level. The United Nations estimates there are 840 million undernourished people in the world. The majority of undernourished people (799 million) reside in developing countries, most of which are on the continents of Africa and Asia. This figure also includes 11 million people located in developed countries and 30 million people located in countries in transition (e.g., the former Soviet Union). The U.S. Department of Agriculture estimates that nearly 11 percent of U.S. households are food insecure, with approximately one-third of these households experiencing moderate to severe hunger. In developing countries, the root causes of food insecurity include: poverty, war and civil conflict, corruption, national policies that do not promote equal access to food for all, environmental degradation, barriers to trade, insufficient agricultural development, population growth, low levels of education, social and gender inequality, poor health status, cultural insensitivity, and natural disasters. In the United States, the primary cause of food insecurity is poverty. Low levels of education, poor health status, and certain disabilities also increase the risk of food insecurity for individuals and households in the United States. Globally, certain groups of people are more vulnerable to food insecurity than others. Vulnerable groups include: victims of conflict (e.g., refugees and internally displaced people); migrant workers; marginal populations (e.g., school dropouts, unemployed people, homeless people, and orphans); dependent populations (e.g., elderly people, children under five, and disabled and ill people); women of reproductive age; ethnic minorities; and low literacy households. 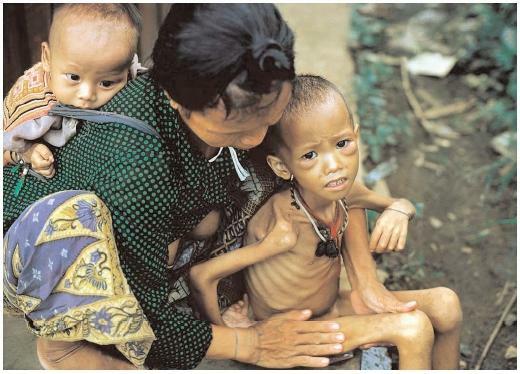 Food insecurity affects millions of people around the world, including these children in Thailand. The situation in that country and a handful of others has improved slightly, but progress is slow. that enough safe and nutritious food is either domestically produced or imported from the international market. However, food availability does not ensure food accessibility. Government policies must also contribute to equal distribution of food within nations, regions, and communities. In addition, for food to be accessible, individuals and families must be able to afford the food prices on the market. Finally, food must be properly utilized. Proper utilization depends on proper food storage to guard against spoilage, appropriate handling to avoid disease transmission, and proper preparation to ensure nutritiously balanced meals. Individuals need adequate amounts of a variety of quality, safe foods to be healthy and well-nourished. Undernutrition results from an insufficient intake or an improper balance of protein , energy , and micronutrients. Nutritional consequences of insufficient food or undernutrition include protein energy malnutrition , anemia , vitamin A deficiency, iodine deficiency, and iron deficiency. Food insecurity and malnutrition result in catastrophic amounts of human suffering. The World Health Organization estimates that approximately 60 percent of all childhood deaths in the developing world are associated with chronic hunger and malnutrition. In developing countries, persistent malnutrition leaves children weak, vulnerable, and less able to fight such common childhood illnesses as diarrhea, acute respiratory infections, malaria , and measles. Even children who are mildly to moderately malnourished are at greater risk of dying from these common diseases. Malnourished children in the United States suffer from poorer health status, compromised immune systems, and higher rates of illnesses such as colds, headaches, and fatigue . Adolescents and adults also suffer adverse consequences of food insecurity and malnutrition. Malnutrition can lead to decreased energy levels, delayed maturation, growth failure, impaired cognitive ability, diminished capacity to learn, decreased ability to resist infections and illnesses, shortened life expectancy, increased maternal mortality, and low birth weight. Food insecurity may also result in severe social, psychological , and behavioral consequences. Food-insecure individuals may manifest feelings of alienation, powerlessness, stress , and anxiety , and they may experience reduced productivity, reduced work and school performance, and reduced income earnings. Household dynamics may become disrupted because of a preoccupation with obtaining food, which may lead to anger, pessimism, and irritability. Adverse consequences for children include: higher levels of aggressive or destructive behavior, hyperactivity, anxiety, difficulty with social interactions (e.g., more withdrawn or socially disruptive), increased passivity, poorer overall school performance, increased school absences, and a greater need for mental health care services (e.g., for depression or suicidal behaviors). To understand the magnitude of food insecurity, hunger, and malnutrition, one must consider both the continued rapid growth in world population and the number of individuals below the poverty line. In 1999 the world population reached 6 billion. The United Nations estimates the world population will exceed 8 billion by 2025. In terms of poverty, the World Bank estimates that nearly 1.2 billion people live on less than one dollar a day, which is the internationally recognized standard for measuring poverty. Another 2.8 billion live on less than two dollars a day. In addition to these progress-slowing conditions, the number of under-nourished people is actually growing in most developing regions. A few large countries have made significant gains, making the global picture appear more promising than it really is. China, Indonesia, Vietnam, Thailand, Nigeria, Ghana, and Peru have all made important gains in reducing food insecurity and hunger. However, in nearly fifty other countries, the number of undernourished people increased by almost 100 million between 1993 and 2003. The absolute numbers continue to rise as a result of rapid population growth, even though the proportion of undernourished people in most developing countries is actually decreasing. Worldwide commitment to improve global food insecurity was demonstrated at the 1996 World Food Summit, where 186 countries pledged to reduce the number of hungry, food-insecure people in the world by 50 percent (to 400 million) by the year 2015. Progress toward this goal has been slow, with a decrease of only 2.5 million people a year since 1992. At the current pace, the goal will be reached more than one hundred years late. Despite slow progress, some innovative programs have been implemented around the globe to combat food insecurity and undernutrition. Examples of innovative program include: community gardens, farmers markets, community-supported sustainable agricultural programs, food for work exchange programs, farm to school initiatives, credit to poor households, income transfer schemes, and agricultural diversification programs. Food insecurity remains a significant international problem, with developing regions of the world enduring most of the burden. Food insecurity results in considerable health, social, psychological, and behavioral consequences and is undeniably linked to poverty. Despite international commitment, the number of food insecure individuals remains unacceptably high. SEE ALSO Famine ; Food Aid for Development and the World Food Programme ; Food and Agricultural Organization ; Food Safety ; Hunger ; Malnutrition ; United Nations Children's Fund (UNICEF) .